IT IS ORDERED that Plaintiff show cause within seven (7) days of the date of this Order why this Court should not dismiss this case. 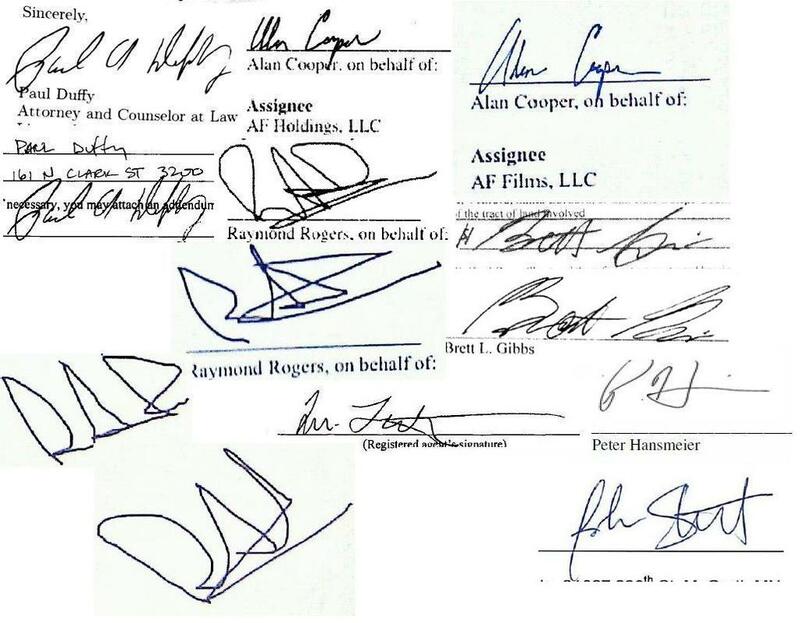 To the extent that Plaintiff asserts a right in the continuation of this case, Plaintiff is ordered to identify: (1) the persons who signed Exhibit B in the names of Raymond Rogers and Alan Cooper; (2) all persons who hold any interest in Plaintiff; and (3) if Exhibit B to the Complaint is in fact not signed by Alan Cooper and/or Raymond Rogers why Plaintiff and/or counsel should not be sanctioned pursuant to the Court’s inherent power and Fed. R. Civ. P. 11 for filing a fraudulent document with this Court. In the interim, this action is stayed until further Order of this Court. Why did I say that the background is not really relevant? Well, the following story could be injected by Prenda into any lawsuit where a judge questioned Alan Cooper’s signature. When after 6 months of struggling with writer’s block, Steele and Hansmeier came up with a story that “plausibly” connects the dots in what we call Coopergate, the judge’s order directing troll Steven Goodhue to confirm the validity of the copyright assignment signatures was a convenient moment. Emboldened by recent relative victories, the gang is gambling on judge’s gullibility, yet with Aaron Kelly’s firm involvement in this case, I wouldn’t bet a single penny on Prenda’s “red” (herring). Yes, it took six months of inventive evasion, attempts to remove a judge from a case, lies, invoking the Fifth Amendment to finally come up with a crafty plot that for the first time explicitly accuses Steele’s caretaker Alan Cooper of willfully participating in Prenda’s “business.” Furthermore, the trolls accused Cooper of changing his story with a goal of extorting Steele & Co.! While this is no more than one in a series of delaying tactics, it is really sad that the crooks continue bringing hell to a simple man’s life. Sad, but inevitable: you cannot expect anything but a blank stare from these heartless creatures when they witness suffering. A closer look at troll Goodhue’s response to Order to Show Cause. Alan Cooper fable: more scrutiny and more questions. TechDirt: Prenda Continues Character Assassination Of Alan Cooper by Mike Masnick. Funny: the document metadata reveals the “Title”: Microsoft Word – FINAL Response. Yes, all capitals. So at least they are contemplating a possibility of cutting and running. Very entertaining, I think I read this story when I was young, it was called Dr Alan Jekyll & Mr. Cooper Hyde. Of course there is a police record after Alan stole “hundreds” of items, threatened people, took a chain saw to St. John’s cabin, stole a trailer full of furniture and cut down the forest? Yes, I bet the police record will be found next to the documents with the original Allen Cooper and Salt Marsh signatures. Now the old “he said – she said” becomes ” he did- she did”. Chain saws.leave marks, and doctors and prescriptions leave records. The truth will out. The story is plausible on its surface. BUT. If this story was true, why wasn’t it filed when the issue of Alan Cooper’s signature first arose? Why would Steele default instead of using this story as the opportunity to slam Cooper and feel vindicated? Why would Steele invoke the 5th instead of gleefully telling Judge Wright about the ‘truth’ in April? Why wouldn’t Hansmeier mention it in the initial responses to Godfread? Why wouldn’t all of the Prenda affiliated attorneys file copies of this everywhere instead of merely relying on the “assignee’s signature is irrelevant” legal theory? Why wait until after a sharp but limited and another utterly devastating judgment to bring it out? ISTM that this should be easy to counter – a Cooper declaration that he never signed any documents, nor gave anyone else permission to sign for him. And then attach the order from the Minnesota* judge saying never to use Cooper’s name again, sanctions should follow. *Was it Minnesota or Illinois? I can’t keep them all straight anymore. Is is a coincidence that this response showed up right after Cooper’s Minnesota law suit was concluded? @DarthSkeptic: The answers to your questions are very simple–plausible deniability for Steele. If Steele tried to pull that fable on Judge Wright, he’s just turn to Cooper or Cooper’s attorney and ask if any of it’s true. On the other hand, if he can get Nosehair to put that story out there, then Cooper is slimed, and his hands are clean. Notice that there is nowhere in the filing where Steele says anything under oath. Of course, the secondary purpose is continue to hassle Cooper. Now, he has to expend time and money to fight these allegations, further disrupting his life. It is odd, though, that it’s totally OK for lawyers to pay for expert witnesses, fly them in to court, and everything’s hunky-dory. But, for EFF to fly Cooper to LA is somehoe irrretrievably tainting. These clowns can’t be taken down soon enough for me.